On my most recent visit to Pro Mujer Mexico I had the opportunity to meet with three inspiring entrepreneurs and learn up-close how our investments impact real lives. 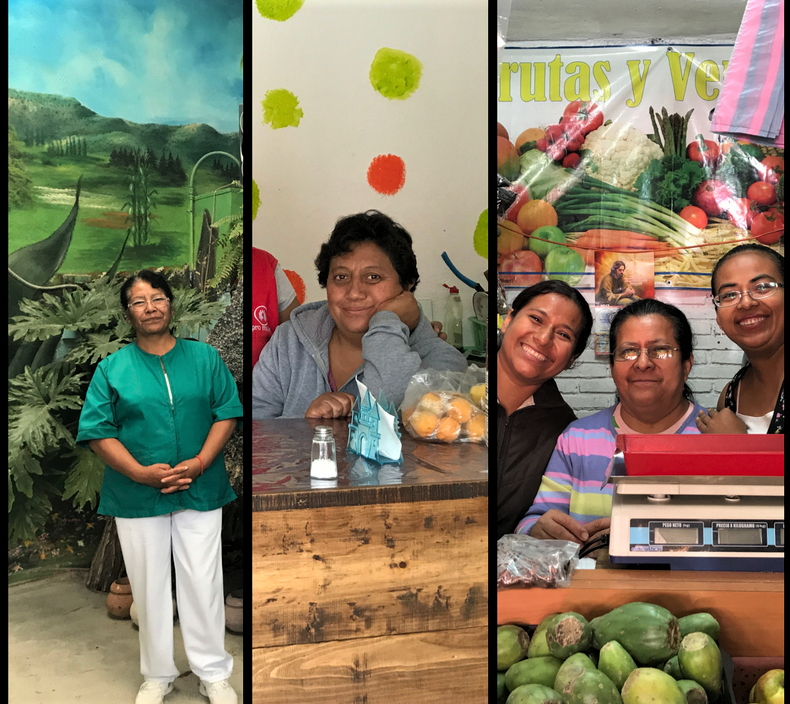 Pro Mujer is an outstanding microfinance organisation with operations across 5 Central and South American countries and Deetken Impact provides them access to capital to lend to their clients and support their operations in health and education services. My first visit took place in Tezontepec, a small town about 2.5 hours east of Pachuca, home of Pro Mujer’s head office. The road narrows from freeway to rural highways through agricultural lands and eventually the narrow streets of the town centre on a hillside. We pick up Lenin, the head of the office, who also happens to be the loan officer for Marta. You can see that they know each other well, and it isn’t surprising given that Marta has been a client for 10 years and 29 loan cycles. Marta is an example of the success of Pro Mujer’s programmes. She has gone from selling tortillas to owning a successful business which includes nutrition and spa treatments inspired by their indigenous community. Marta became interested in these therapies from her husband who practices in the same field. Their house was too small to use as a full-time practice. 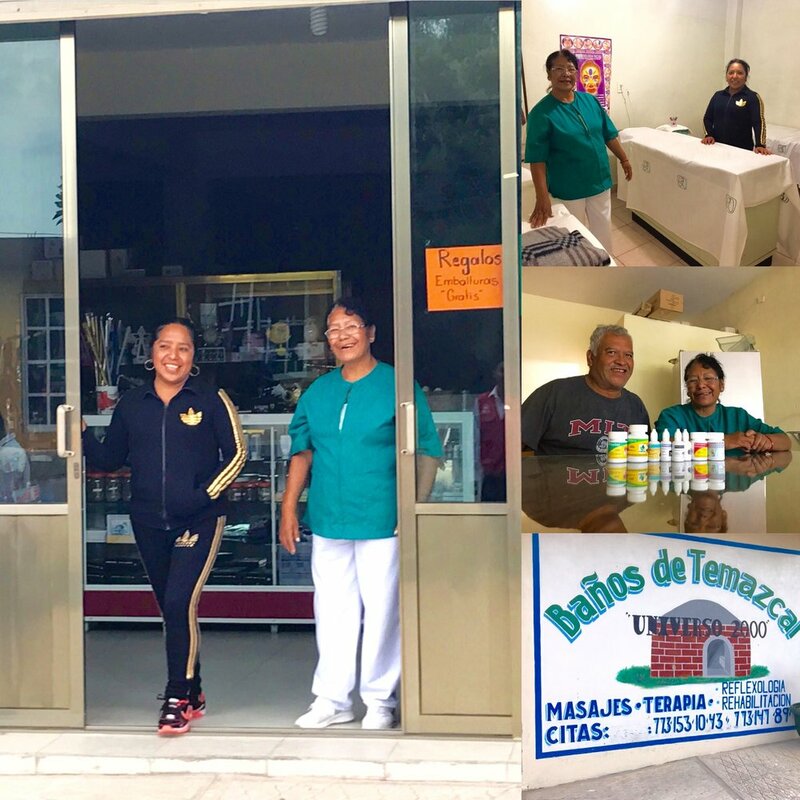 Funding from Pro Mujer has not only allowed her to buy the land and construct a building but also for her and her daughter to earn diplomas in naturopathic medicine. She is a specialist in medicines and her daughter in massage. Loans then allowed her to expand her services and broaden the range of products that she offers. This includes a greenhouse for medicinal plants and a special sweat lodge used in combination with other therapies. As her business includes the use of traditional plants and techniques I am hopeful that it can help in the preservation of the region’s indigenous knowledge. What’s next for Marta? We’ll soon see as she has a proactive personality, continuously looking to expand her knowledge and business. We have returned to Pachuca, an industrial city two hours east of Mexico City, and we visit Pro Mujer entrepreneur Maria de los Angeles in a sprawling part of the city outside the historic centre. Here Maria has created Cocina Economica which means “Affordable Kitchen”. It provides popular Mexican food at low cost, yet it still includes table service so workers from the neighborhood and the school across the road can rest their legs. Maria had no experience managing a restaurant or a kitchen but the opportunity to rent a spot across from the busy school was too good to pass up. She opened it originally as a breakfast spot and teachers would come every day. The teachers were followed by school staff and then more people from the area. Her loans have helped her set up her business, have cash to pay the rent up front, and slowly add tables and chairs. Maria has been a PM client for 3 years and 6 months and her Pro Mujer loan officer, Fabiola, has been there along her side during her journey. Before Pro Mujer, Maria took care of children and the house she lives in. She was also selling goods via catalogue, which is a common starting point for many women in Pachuca. Maria’s loan group is now at 16 members and they are on their 12th loan cycle. Maria finds everyone in the group to be very responsible and also very supportive of each other. These days, Cocina Economica gets quite busy and sometimes her friend Ibis, her son and daughter all help out. Despite the success, Maria is ambitious: she has heard that another similar sized restaurant is available and she may be soon taking on both businesses. Back on the road and 475 winding and beautiful kilometers to the south we arrive in Oaxaca, an area recently affected by two powerful earthquakes. Oaxaca is among the most culturally rich locations in Mexico, its cobblestone streets and colourful colonial buildings are striking to an outsider like me. Despite its beauty, Oaxaca has significant poverty. Here I meet Maria-Elena and her daughters. The bold Maria-Elena and daughters Ibis and Geysi in their "bodega"
Maria –Elena has been a client for 1.5 years and is into her 5th loan cycle. Before opening her store, she was a street vendor and then worked in a cookie bakery. Her daughters Ibis and Geysi, one of whom has now graduated university, previously sold these cookies from the same factory, going store-to-store. Her store has grown from a fruit and vegetable kiosk to offering personal care products, meat, cheese and milk. Loans have helped her to sell these higher value products and build out the store with shelving, counters and appliances. Her daughters, Geysi and Ibis proudly tell me their mother is in the “leading lending group” in the city. I’m thinking this healthy competition drives even more excellence from Pro Mujer clients. They are all a force: bright, charismatic and full of confidence. As I leave, I thank them for their warm hospitality and they boldly tell me that they will come visit me at my home in Canada. I, of course, gladly extend the invitation to my new associates. Last week, we had the opportunity to attend the 9th annual Caribbean Renewal Energy Forum (CREF) in Miami, Florida. The event has grown rapidly in importance during the last couple of years, and it focuses on the emerging trends in renewable energy across this region. Among the keynote speakers during the opening ceremony, we heard from the honorable Jennifer McIntyre, Canada’s Ambassador for Climate Change. She emphasized the historical immigration links between Canada and many of the Caribbean nations, and the joint commitment to combat climate change through sustainable energy practices. Deetken Impact was invited to the Conference by one of our partners in the region, the Caribbean Basin Sustainable Energy Fund (CABEF), whose geographical mandate includes not only the small and large Caribbean islands, but also the Central American countries that share the Caribbean basin. Fernando Alvarado, CEO of CABEF, was a keynote speaker and a panelist in the topic of how to unlock private and public sector financing for renewable energy projects. After such a strong and devastating hurricane season, the discussion also focused on the destruction and reconstruction needed across the Caribbean. Despite all the challenges, there is cautious optimism that the recent events will force policy makers, utilities, and community leaders to plan for a more resilient and sustainable energy framework. Some of the frequently heard topics included microgrids, inter-island grid connectivity, resiliency alternatives, and energy storage. It is noteworthy to mention the large delegation of Canadian companies present in this year’s CREF: over 40 companies, which were by far the largest contingent from outside of the Caribbean. Canada had the largest meeting facilities, and plenty of networking activities organized by Trade Commissioners from Global Affairs Canada. Given the unique challenges and opportunities across the Caribbean basin, we expect that the Deetken Impact Fund will continue to support projects in renewable energy, a key impact sector for our Fund. Effective measurement of the social and environmental benefits of our investments is a significant challenge for all impact investors. In fact, more than one article has referred to impact measurement as the “quest for the holy grail". 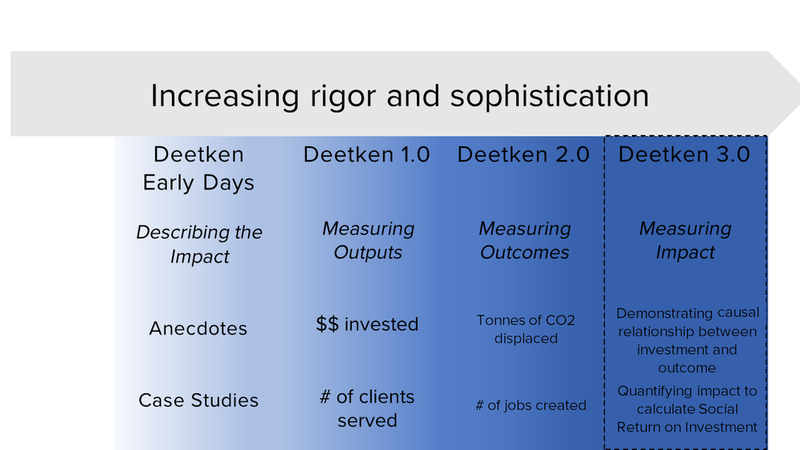 At Deetken Impact, we are continuously refining and improving our approach so that we can report richer and more meaningful information to our investors. This is a snapshot of our journey to measure and report our impact. We hope that by sharing it we can support other impact investors who are tackling the same challenge, and learn from those who are developing and refining their own methodologies. When we first began to invest in impact back in 2007, our approach was straightforward. We focused on qualitative information and anecdotal evidence to help our investors understand why our portfolio companies were so different from mainstream investments. e would describe how one of our investees, a financial institution in Honduras, for instance, offered its clients preventative health screening services in addition to business loans, and that for many of its clients living in rural areas this was the only time they were able to see a medical professional. Several years ago, we took a major step forward to formalize our approach with the deployment of a customized social impact measurement and evaluation tool focused on microfinance and SME lending. For the first time, we could quantitatively compare the impact of different investments in our portfolio. This was tremendously valuable as a decision-making tool for Deetken Impact. 1. Our investment mandate had broadened over time to include businesses outside of the financial services space, such as renewable energy projects. 2. We noticed that some information we were collecting from our investee companies was more meaningful than other information. We wanted to streamline our data requests to make ongoing reporting quicker and easier for our partners. We wanted to align our approach with international frameworks including the Sustainable Development Goals and IRIS, an initiative of the Global Impact Investing Network. 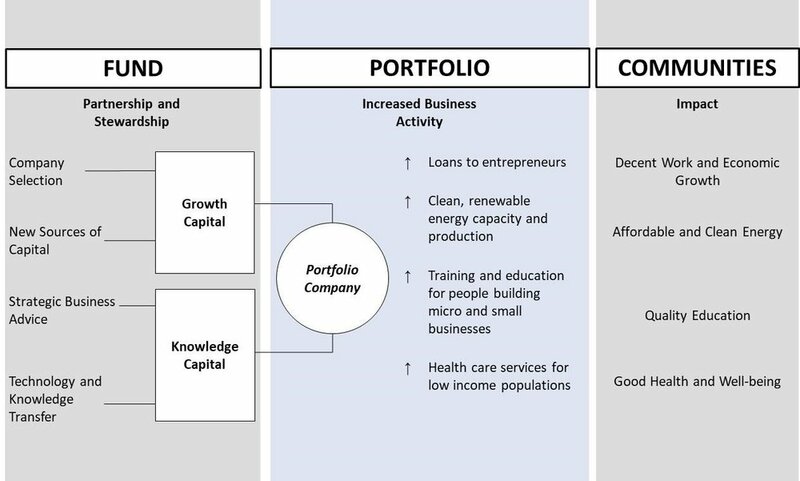 We viewed this alignment as an important way to support the impact investing ecosystem while ensuring that our impact measurement and reporting was as understandable and transparent as possible for our investors. The first step in our refreshed approach was to carefully define our impact goals. It was important to us to align these goals with the Sustainable Development Goals (SDGs), a global agenda to end poverty, protect the planet and ensure that all people enjoy peace and prosperity by 2030. The SDGs comprise 17 core goals that range from ending hunger to stemming climate change. We are strong supporters of the SDGs as a useful framework to communicate and align impact objectives across a broad group of stakeholders including governments, NGOs and non-profits as well as investors. One of the funds we manage, the Deetken Impact Fund, makes investments in financial institutions, renewable energy projects and social enterprises. 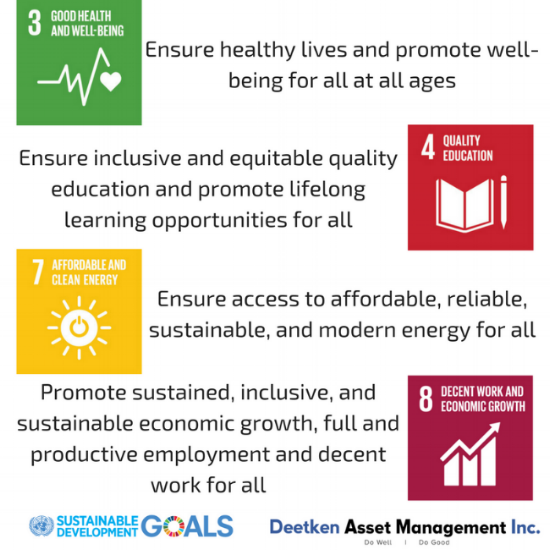 These investments drive impact outcomes which are well-aligned with the SDGs, as shown below. We wanted to be clear about how and what impact is generated by our investments. Like the thesis statement of an academic research paper, this statement anchors our analysis and is ultimately what we seek to measure. We had two primary objectives for our measurement framework: we wanted it to be streamlined and user-friendly, and we wanted it to be aligned with IRIS. IRIS is a catalogue of generally-accepted performance metrics that leading impact investors use to measure the social and environmental performance of their investments. Where the SDGs set big, broad goals for long-term change, IRIS provides metrics for measuring more specific, near-term results. We “cross-walked” our SDG targets and IRIS metrics to translate our goals into something that could be tracked and measured. Through this process, we selected a concise set metrics for each of our investment sectors. Importantly, most of our selected metrics are quantitative and can be “rolled up” from the investee company level to the aggregate portfolio level for the purposes of consolidated reporting to investors. So how does all this work in practice? We use our selected metrics to conduct an impact screening of each portfolio company candidate. The candidate metrics are assessed by Deetken Impact on a relative basis alongside the metrics of comparable companies. For ongoing monitoring purposes, our selected metrics are informed by data which can be readily provided by investee companies on an ongoing, consistent basis. (1) We support the UN's 2030 Agenda for Sustainable Development and the Sustainable Development Goals (SDGs). The SDGs comprise 17 goals that range from ending hunger to stemming climate change. The DIF targets 4 goals within this set: SDG3, SDG4, SDG7, and SDG8. (2) IRIS is a catalogue of generally-accepted performance metrics that leading impact investors use to measure the social and environmental performance of their investments. (3) While loan acceleration is an important protection, we rarely view this approach as an appropriate remedy. We take price in our reputation for highly constructive negotiations with portfolio companies, in which we focus on solutions that preserve our capital while maintaining the stability of our investee's business. 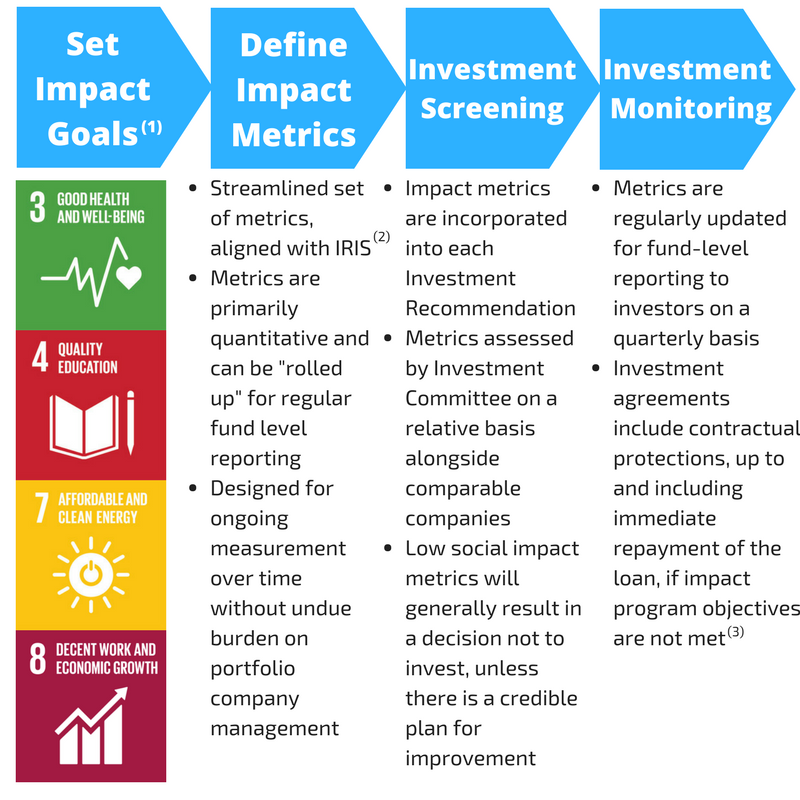 As for many impact investors, impact measurement is a balancing act between our desire to deeply understand the nature of our impact and the ability of our investee partners to track and report on meaningful metrics. One way to think about impact measurement is as a spectrum from the most practical to the most rigorous approach, as illustrated below. At this stage, we have made good progress towards measuring the outputs and outcomes of our investment portfolio. However, we remain keenly interested in deeper measurement of social impact and have been actively working with some of our investees to develop tools for assessing causal relationships between our investments and our impact goals. For instance, we recently worked to implement the Progress out of Poverty Index (PPI) methodology at one of our portfolio companies in Mexico. PPI is an innovative way to evaluate a sample of clients before and after they receive services by the organization by using straightforward but revealing questions to track how living standards may have improved. The objective is to understand, from a longitudinal perspective, the impact of our activities on client incomes, lifestyle and overall well-being. Effective impact measurement will always be one of our most challenging responsibilities. But we believe that by sharing best practices and continuously working to gather better and more meaningful impact data, it needn’t be as daunting as King Arthur’s quest.